A leaking gas is an indication that an internal component such as a valve or seal is broken. Gas boiler leakage can lead to rust or corrosion, or it can cause the electrical components within the boiler to short circuit. Other devastating problems include structural damages in your premises. Gas leakage is a serious problem that should be attended to immediately by a professional. The first step towards solving gas and boiler leaks is to identify where the leakage is coming from. Our engineers in Morley, Holbeck, Castleford, Wetherby, and Headingley are certified to handle any gas leak professionally. When you contact us, we take it as a priority to find out if the boiler is leaking from the bottom, below or the sides. Next we take time to find out the cause so that we can offer a long lasting solution. Corrosion – Boiler tanks and pipes corrode making them weak and in return, water leaks out. In such a case, our technicians seek to determine if the corrosion has affected a single component or it has spread to several parts. If only one part is damaged, we replace it but if the corrosion has spread to several parts, we recommend replacing the boiler. Pipe Fitting – Water leaks from the boiler pipes if they have not been properly installed. The best way to correct the leakage is by replacing the pipes, but at times we may need to replace the appliance. Pressure Problems –Boilers have pressure outlet pipes on their side which releases excess pressure. When the pressure in the boiler is too high, the boiler leaks from the pressure valve. The normal pressure for a boiler is 18 to 21 PSI. If the pressure goes beyond this limit, the boiler leaks water to prevent the boiler from rupturing or blowing up. It is therefore normal to find drops of water at the location of the pipes. If you realize the water is more of a puddle than a few drops, then you should know there is a problem. To correct the situation, we examine the boiler for any build up in the lime scale as it can cause pressure increase beyond the maximum level. Sometimes gas leaks from the temperature valve which in that case we rectify the temperature probe as it is the cause of the leakage. Loose Joints And Seal Problems – Over time, the excess pressure from the boiler can shorten the life of the seals by exposing them to excess pressure and heat. The seals wear down and lose their ability to be watertight. The pressure from the water hence pushes through the loose seals leading to leakages. Gas and boiler leaks require professionals like us, Eco Efficient Leeds to deal with them. 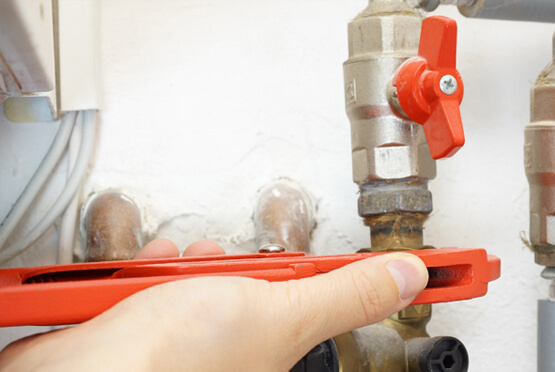 We understand how inconveniencing a leaking boiler can be so we arrive and repair the issue promptly. We guarantee that you will continue enjoying your warm water and central heating system within no time. Talk to us now and get the best services in Leeds.